"Voted #1 Oktoberfest in Houston"
The party everyone has been waiting for is back and twice as big! Kings is bringing the best Oktoberfest celebration to Pearland & Houston for two amazing weekends in October! 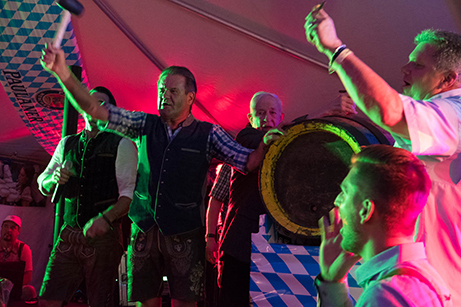 Enjoy Live German Music, Massive Oktoberfest Tents, Exclusive German Biers, Authentic Oktoberfest Food, Bavarian Strongman Competition, Exclusive VIP Packages, and Much More. 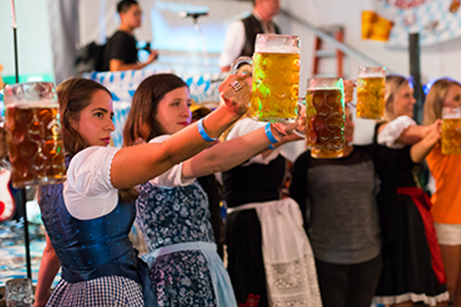 Plus, Kings is giving away TWO All-Inclusive trips for two to Oktoberfest 2019 in Munich, Germany! 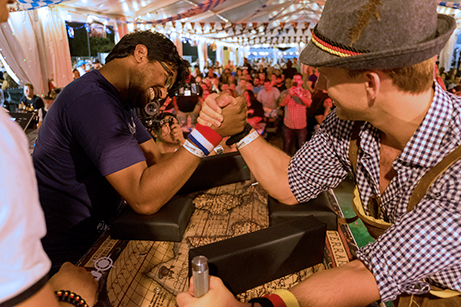 Join Hans & Philipp Sitter as we tap the 150 year old ceremonial wooden keg to start the festivities, just like Munich! We’ll all drink the keg till it’s dry. Bier taste better from a wooden keg! Lets see who’s the real King of Oktoberfest! 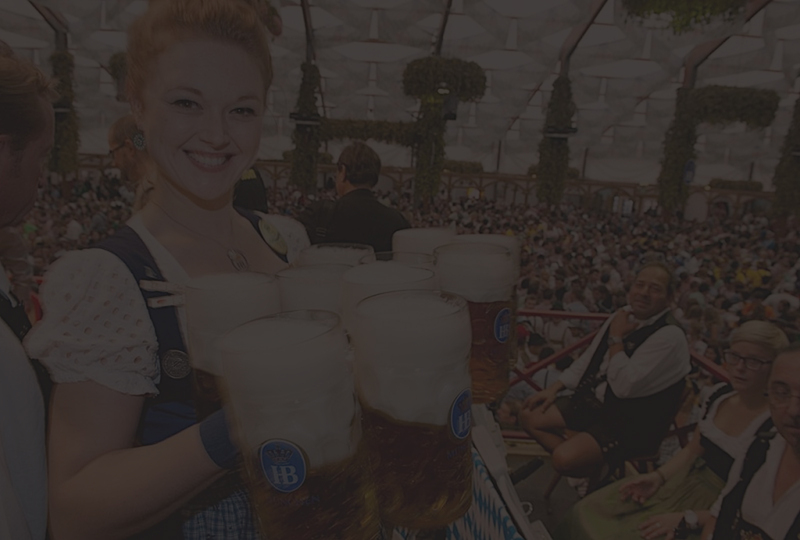 See how long you can hold a 1 Liter Mug filled with Bier. Winner Receives the Liter Mug and The Bier. Plus, each winner will become automatic finalist for the grand prize trip to Oktoberfest in Germany! 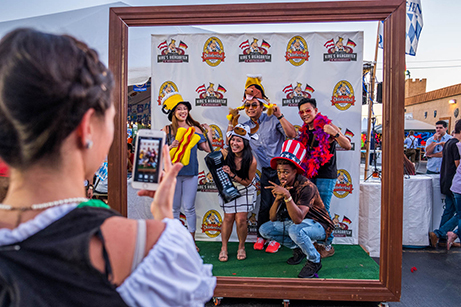 Get into true Oktoberfest spirit by taking your photo in our official booth! Absolutely FREE for your enjoyment. We’re proud the present some of the areas most unique vendors and craftsman. 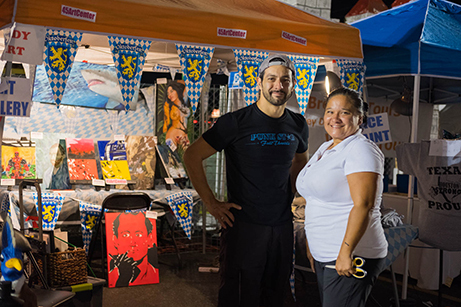 Specialty leather goods, apparel, exclusive decor, and Art, it’s all here for you at Oktoberfest! The later it gets, the more fun it is. With your attendance to our Oktoberfest event, you’ll receive a free raffle ticket to be entered in our Grand Prize drawing. Each day you come, you’ll get another ticket for the free raffle! This Grand prize includes Flight, Hotel, Oktoberfest Tent Reservations, and a Tour Guide for Oktoberfest 2019 in Munich. **Each Night We’ll Draw 10 Finalists Each Night, Must be Present Sunday at 7pm to win. Each time slot we’ ll select a group of guys and girls, split them into teams, and have them face off. 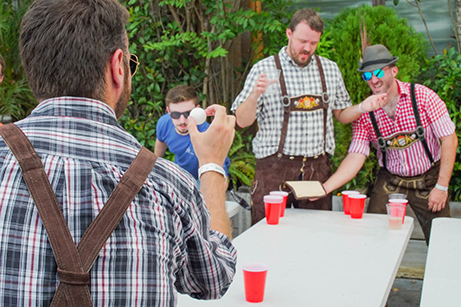 The team that wins will win an assortment of prizes: Steins, Shirts, Gift Cards, and of course, bragging rights! Sign up in our vendor court for a chance to win $500 in cash. 16 teams will be accepted, 1 team will win! All-Inclusive Bier & Wine, 3-Course Chef Driven Oktoberfest Menu, Skip the Lines and so much more! Continue reading to see everything VIP has to offer. 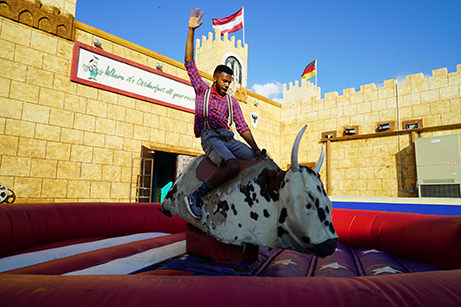 VIP is truly the best way to experience Oktoberfest! You won't have to wait in the long lines! VIP Tickets are extremely limited and in high-demand. 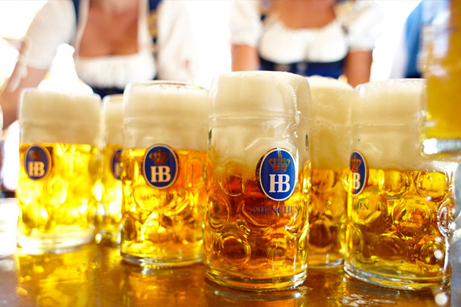 Fast Pass: Skip the line, get your complimentary Bier faster than anyone else! Franconia Oktoberfest, Paulaner Hefeweizen, Hofbräu Oktoberfest Marzen, Warsteiner Oktoberfest, Hacker Pschorr Oktoberfest, Hacker Pschorr Munich Gold, Hacker Pschorr Munich Dark, Hofbräu Oktoberfest Weis’n, and Paulaner Oktoberfest! Authentically Bavarian, perfect to eat at our festival setting. Variety of Wursts, Smoked Ribs, 8-Hour Roasted Turkey Legs, German Chocolate Cake and much more. VIP’s enjoy a complimentary chef-driven, 3-course menu. Having trouble purchasing tickets? Click here to open in new window. 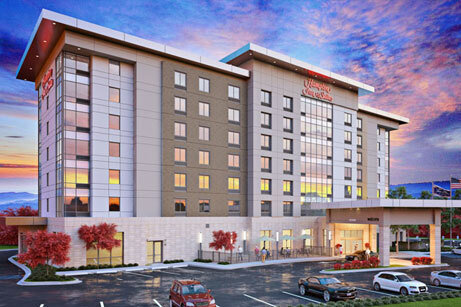 See below for hotel options for King's Oktoberfest. 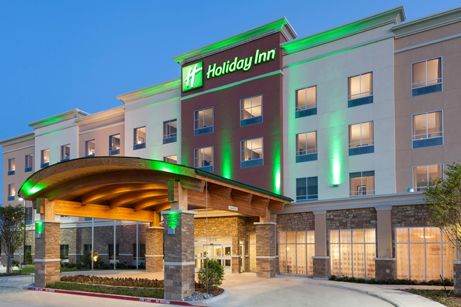 Must call hotel directly to book, 281-997-2000, and mention you are coming for King’s Oktoberfest. For Pearland– Park at Home Depot on the corner of Dixie Farm Rd & 518. It is our FREE Shuttle lot. Festival is fun for all ages. 21 or above for any bier or alcohol of course! We do have a “Underage” ticket available for those under 21 for VIP. Kids 8 and under are free. Kids of all ages must have an underage VIP ticket. Does My VIP or General Admission Ticket work for each day of the festival? No, all GA Tickets can only be used once. You’ll have to purchase multiple tickets. Where Else Can I Buy Tickets? You can buy tickets online, at the restaurant, or at the event. All the tickets are subject to sell out! There is no guarantee we will have VIP or General Admission Tickets left. Does general admission come with food & drink? 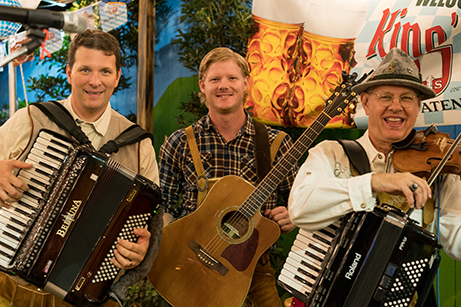 General admission includes: Entry to the Oktoberfest tent, Free activities, and Live music. It does not include food or drink. Yes, we will scan it in at the door. Yes, however, once a ticket has been scanned it will not scan again. How do I win the Grand Prize Trip? All you have to do is come to the event! Must be 18 or older to win. 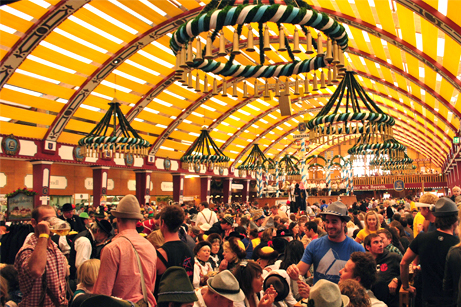 Grand Prize: Trip for Two to Oktoberfest 2018 in Munich Germany. Flight and Hotel Accommodations. Follow the signs when you arrive. It will be the nearest parking lot to King’s Biergarten. What is Beer Hall Seating? Years prior we made table reservations, we found this to be lots of trouble for our guests to coordinate with one another. This year, all the tables will be pushed together, you’ll be able to sit wherever and with whoever you like. The seating will not be reserved or designated. What is included on the Inclusive Draft Beer and Wine? All of our Draft beer is included. We will serve them in 1/2 Liter increments. Our House wine by Sycamore Lane will be included for wine. As well as all of the Biers mentioned in the Oktoberfest Bier Lineup above. What is the Full Bar? At the festival we will have a limited selection of liquor. In the VIP area you will have full access to purchase an liquor we carry or we can make any cocktail. This is not included in the ticket price. What is the 3 Hour Time Slot? When you purchase your tickets, you’ll choose your time slot. This time slot is when your dining reservation will take place for the 3- Course menu. If you miss this reservation, we cannot repeat service. When your time is up, we will ask you to join us at the bar, at the festival, or in our VIP garden, so we can make room for the next round of reservations. Year prior we had the VIP set up where you could only get beer/wine in the VIP Area. This year you will have complete access to the festival with your own VIP line, so you won’t have to wait! What is the 18% Service Charge? We’ve included an 18% service charge for each ticket sold to be given to your server the day after your reservation. You will be fully waited on at your table. Are there VIP Packages for Underage? Yes, they are priced at $60 for those who are underage and cannot consume alcohol.